We recently wrote about a study of US consumers regarding technology and medicine conducted by Deloitte last year. The survey found that more than half of respondents would use telemedicine, but it also found some lingering concerns about the approach. In order to help healthcare providers address them and be prepared for likely questions from patients, we’ll take a closer look at each one. Of those who replied to the survey, 43% reported some level of concern about the quality of care during a video visit vs. an in-person interaction. This is not surprising given that most people have little to no experience with remote care. One way to address this concern is to be clear that not all situations are right for telemedicine. In some cases, an in-person visit is absolutely required. Qualified medical professionals know which cases are a good fit for remote care and will refer others to an in-office setting. For appropriate cases, however, the research, including more than 2000 studies, shows that remote visits can be as effective as in-person ones and can even earn higher satisfaction scores. Another 35% of respondents are concerned about the privacy and security of their personal health information. This is a very valid concern and something that consumers are right to ask about regarding any internet-based interaction. Fortunately, HIPAA requires providers to take the same care to protect personal health information during an online visit as they do for an in-person one. This means using only HIPAA compliant, highly secure applications designed for this purpose. Patients concerned about privacy should never agree to encounters conducted over consumer-grade applications like Facetime or Skype, but they can be confident that their information will be protected when purpose-built telehealth software is used. Some respondents (33%) are worried that the personal touch will be lost when receiving care via telemedicine. Experience is probably the best way to overcome this concern, but providers do need to take care during video visits to establish a strong personal connection. (Here are some tips on how to do that.) Each patient will have to decide for themselves whether the convenience of remote visits is worth the tradeoff of in-person contact. There are definitely some social upsides of going to the doctor’s office, especially for patients who are otherwise home-bound, but this doesn’t seem to be a widespread concern, with only 15% of respondents pointing it out. We were, frankly, a bit surprised at how few people were concerned about learning a new technology. Only 15% cited that as a concern when it comes to telehealth. 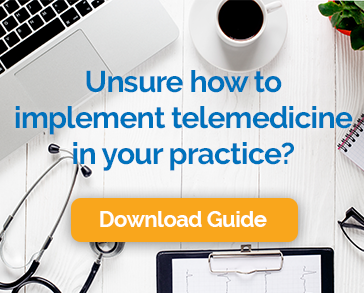 That’s great news for providers that want to include telemedicine in their practice. Of course, it is essential to choose a technology that is easy for patients, providers, and office staff to learn quickly. It should have built-in support features to assist when questions arise and should be fully integrated with the EHR system. Anytime people are introduced to a new way of doing things, there will inevitably be questions and concerns. This is especially true when it comes to matters of health. Providers should be prepared to address these concerns and thoughtfully answer patient questions. It is also a good idea to let people give telemedicine a try for routine matters like medication checks or reviewing test results. This will help them get more comfortable with the experience and make them more likely to use it for other encounters. Many patients will find that the benefits of telemedicine make it more than worth any downside.